Situated at the end of Gordons Close, a well established residential cul-de-sac close to the centre of Stithians village. This detached 3-bedroomed bungalow is attractively presented and occupies an incredibly generous corner plot, and benefits from oil fired central heating, a large living/dining room, 2 separate garages, beautifully stocked gardens and 2 separate driveways providing parking for several vehicles. Having undergone extensive improvements both inside and out during our client's ownership, 10 Gordons Close is a deceptive three double bedroom bungalow, offering generous accommodation whilst occupying a delightful, private corner plot. Set at the end of the cul-de-sac, the property benefits from rural views to the front elevation and has a large amount of outside space. The property itself benefits from oil fired central heating and double glazing throughout, and internally the accommodation briefly comprises of an entrance hall, large living/dining room with sliding door to the side garden, kitchen with serving hatch to the dining area, three double bedrooms all with built-in wardrobes, airing cupboard with fitted radiator and a family bathroom with separate bath and shower unit. Attached to the property is a useful utility room housing the oil fired central heating boiler, as well as providing space for a freezer and washer and dryer. A door from the utility room leads to the attached garage with an up-and-over door from the driveway. Externally, there is a secondary detached garage with further driveway parking. To the front of the property is a lawned area bordered by mature flower beds, housing an array of mature shrubs and flowers including magnolias, camellias and rhododendrons; there is also a birch tree with daffodils at the base. There are further garden areas to both sides of the property. The village of Stithians is ideally located between the harbour town of Falmouth and market town of Redruth, with easy access to Helston town and the cathedral city of Truro. The village itself is extremely well served and benefits from amenities such as a shop/post office, public house with darts and pool teams, junior and pre-schooling, tennis courts, a cricket club, rugby club and a skate park for use of the local residents, and a library which runs three days a week out of the local village hall. Close at hand is Stithians Reservoir and water sports centre for family activities and rural walks for those with pets. Stithians Showground is on the outskirts of the village and brings many different events including Stithians Show and the Volkswagen Jamboree at various points throughout the calendar year. A light entrance area with coving, radiator, storage cupboards with shelving and heating controls. Doors to the living/dining room, kitchen, all three bedrooms and family bathroom. Inner hall with loft access and door to an airing cupboard with radiator and shelving. A light double aspect room with large uPVC double glazed window to the front elevation benefiting from rural views over surrounding farmland. Sliding door to the side elevation, leading to the garden. Coving, double radiator, three wall light points, TV aerial socket, wood-burning stove with slate hearth. Serving hatch from the dining area to the kitchen. Comprehensively fitted with a range of worksurfaces, tiled splashbacks and cupboards below, wall mounted cupboards over. Door leading to the rear patio/pathway, double glazed window to the rear elevation. Spaces for a slimline dishwasher, cooker with extractor hood over and down-lights and under-counter fridge. Stainless steel sink with drainer. Telephone point. Coving, large double glazed window to the front elevation, radiator, double built-in wardrobe with shelving and hanging space. Coving, radiator, double glazed window to the rear elevation, double built-in wardrobes with shelving and hanging space. Coving, radiator, double glazed window to the front elevation with views over surrounding farmland. Single built-in wardrobe with shelving and hanging space. Tiled flooring, full height tiled walls, ceiling down-lights. 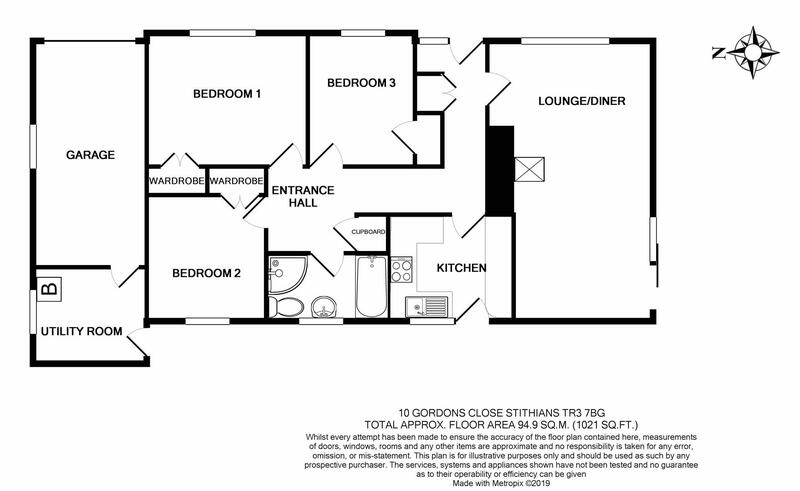 Comprehensively fitted four-piece suite comprising a low flush WC, wash hand basin with shaver points over, bath with mixer tap, corner shower unit with sliding glass door with tiled surround and extractor fan over. Heated towel rail, medicine cabinet. Light and power connected. Side window overlooking the side garden. Up-and-over door. Water tap. Light and power connected. Up-and-over door. There are two driveways leading to each garage providing parking for several vehicles. Lawned area bordered by mature flower beds housing such shrubs and flowers including magnolias, camellias and rhododendrons. Birch tree in the middle of the lawn with daffodils at the base. Greenhouse. Patio area with room for seating. Rosemary bushes, further rhododendrons. This area also benefits from a lawned area and is walled for increased privacy. Space for a rotary washing line. Paved pathway which connects the side garden to the garaging, utility room. The garden to the other side of the property currently laid with pot plants and water butts are also to the rear. Accessed via one of the driveways, this area of garden houses the concealed oil tank. Bordered by mature flower beds with a range of flowers and shrubs making it a rather colourful corner of the plot. With lower lying walls, this garden feels a lot more open and has views over farmland nearby. From the village centre, with the shop directly behind you, turn right and immediately left onto Crellow Lane. Proceed along this road until the end upon reaching the T-junction and turn right. Proceed passing Rose Cottages on the right-hand side and take the first major turning left into Gordons Close. Follow the close around bearing right and the property will be located on the right-hand side.